Economics is a broad and diverse discipline, but most economics textbooks only cover one way of thinking about the economy. This book provides an accessible introduction to nine different approaches to economics: from feminist to ecological and Marxist to behavioural. Each chapter is written by a leading expert in the field described and is intended to stand on its own as well as providing an ambitious survey that seeks to highlight the true diversity of economic thought. Students of economics around the world have begun to demand a more open economics education. This book represents a first step in creating the materials needed to introduce new and diverse ideas into the static world of undergraduate economics. This book will provide context for undergraduate students by placing the mainstream of economic thought side by side with more heterodox schools. This is in keeping with the Rethinking Economics campaign which argues that students are better served when they are presented with a spectrum of economic ideas rather than just the dominant paradigm. 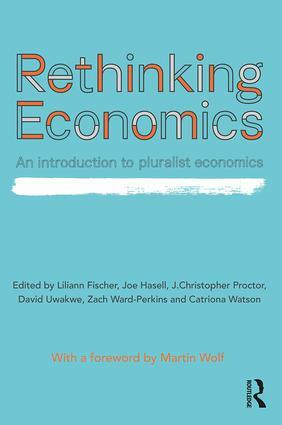 Rethinking Economics: An Introduction to Pluralist Economics is a great entry-level economics textbook for lecturers looking to introduce students to the broader range of ideas explored within the economics profession. It is also appropriate and accessible for people outside of academia who are interested in economics and economic theory. What is Rethinking Economics and how can you get involved?